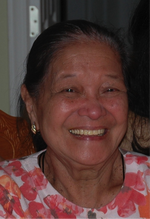 Elena Cuizon, 80, of Finksburg, passed away on January 28, 2019. Born May 3, 1938 in the Philippines, she was the daughter of the late Toribio and Maria (Pinili) Melicotones. Surviving are her three daughters, Nenita C. Guzman and her husband Willy, Angelita C. Dacillo and her husband Levni, Editha C. Caparino and her husband Ofero; three sons, Renato M. Cuizon and his wife Arreza, Rodrigo M. Cuizon and his wife Marilou, Roderick M. Cuizon and his wife Leah, and the late Roberto M. Cuizon. Grandmother of nineteen and great grandmother of two. Visitation will be held Thursday, January 31, 2019, 3:00 pm - 5:00 pm & 7:00 pm - 9:00 pm at Eline Funeral Home, 2901 Bloom Road, Finksburg, MD 21048. A mass will be held on Friday, February 1, 2019, 11:00 am at Sacred Heart Catholic Church, Glyndon, with Father Canisius Tah officiating. Interment will be private. Online condolences may be made at www.elinefuneralhome.com.